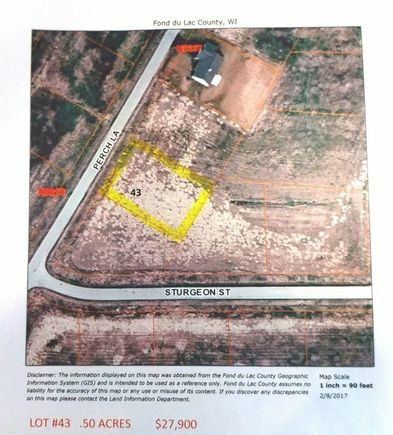 Half acre lot in Fisherman's Estates subdivision! Boat launch located at the end of Fisherman's Rd. Underground utilities. Sewer available at lot line. Well not included. Fisherman's Estates covenants apply. Waste available to site = Laterals. Hwy 151 North to Fisherman's Rd., West towards lake to Perch Ln., Right to sign. The details on PERCH LANE: This land located in Taycheedah, WI 54937 is currently for sale for $27,900. PERCH LANE is a – square foot land with – beds and – baths that has been on Estately for 249 days. This land is in the attendance area of New Holstein Middle School, New Holstein High School, and New Holstein Elementary School.